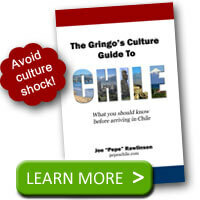 The Chilean President’s weekend and summer palace, Cerro Castillo, sits on a hill overlooking the Pacific Ocean in picturesque Viña del Mar, about an hour and a half northwest of the capital Santiago. The Cerro Castillo Palace was first used by Chilean President Carlos Ibáñez del Campo in 1930. Since that time, the palace has been used by Chilean presidents as a place to rest and also receive guests and dignitaries. The Palace was declared a National Historical Monument in 2005. Due to this status, the palace is open to the public only one day a year, the last Sunday in May which is National Heritage Day. 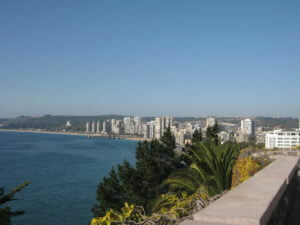 Cerro Castillo is situated in a very nice neighborhood on the same hill with Viña del Mar’s famous flower clock. If you try to visit any other time of the year, the guardhouse and gate may be the best view you get. 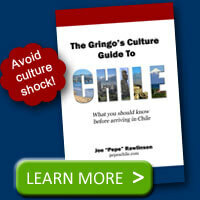 Look for the flag flying over the palace to indicate that the Chilean president is visiting. The palace hosts very well kept and beautiful gardens and many native species of flowers and towering Araucana trees. 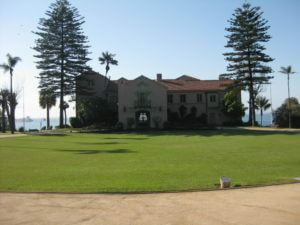 The gardens extend down the hill and can be seen from the main road that runs along the coast. The large grassy area in front of the palace doubles for a helicopter landing pad. On Feb 19 I will be returning to Vina del Mar for the first time in 45 years! I appreciate this updated information….but some things are still the same, like the Flower Clock! So beautiful!!! @Ann – You’ll most likely be surprised at how much the area has grown. However, it is comforting that the classics are still there. @MC – it is a beautiful place! I sure wouldn’t mind a weekend stay here.